High school students search for nitrogen-fixing microorganisms, Montana, USA. SynSym researchers Dr Amaya Garcia Costas and Prof. John Peters have an article soon to be published in American Biology Teacher detailing their summer outreach research program with high school minority students from Montana (Searching for nitrogen-fixing microorganisms: an original, relevant and successful early research experience by Amaya Garcia Costas, Devon L. Ragen and John Peters, American Biology Teacher, publication expected March 2017). For the past three summers, one or two students have joined the Peters lab for five weeks to conduct research aimed at identifying nitrogen-fixing microorganisms in agricultural soils. Students sampled soils cultivated with a variety of crops from which they isolated pure cultures of nitrogen-fixing microorganisms. Amplification of the nifH gene was also performed from soil-extracted DNA. At the end of the program students presented their findings in a poster session and a 15-minute talk. This summer outreach experience has proved to be a fun and effective way to introduce high school students to academic research, to microbiology, and to the topic of nitrogen in agriculture. Appendices to the article that describe specific lab procedures used by the high school students during their research experience can be found here. Pulses are the dried seeds of the legume family of plants, and includes peas, beans, lentils and chickpeas. Pulses are tremendously important for many reasons, not least is that they are high in protein and therefore crucial for food security in many parts of the developing world. Due to their ability to fix nitrogen through the interaction of legume roots with Rhizobia, they are important for improving and maintaining the fertility of the soil in which they are grown. For this reason, pulses play a crucial role in crop rotation programmes all over the world. With a growing awareness of the environmental problems of a world dependent on agricultural intensification for meat production and health issues such as obesity and type II diabetes, one part of the solution to both these is to increase levels of pulses in our diet. As the The United Nations’ International Year of Soils of 2015 comes to a close, the importance of healthy soils is highlighted in Microbiology Society’s briefing entitled Food Security from the Soil Microbiome. A copy of the report can be downloaded from the Microbiology Society here. 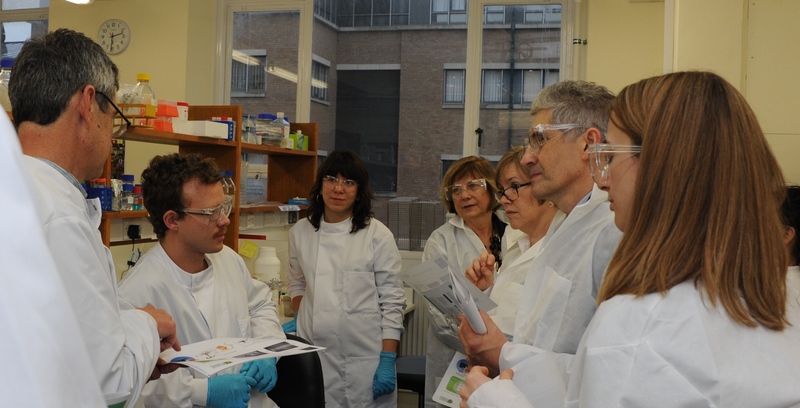 BBSRC CEO Prof. Jackie Hunter led a small group of senior BBSRC personnel on a visit to Dept. of Plant Sciences, Oxford on 21st November 2014. On visiting Phil Poole’s lab the group heard a presentation by SynSym’s Barney Geddes.